You and your child will love wearing these to any function! Wear at playtime, game time or any time wear! Sorry the trim ribbon is not in this picture. Note: You don't need to add the felt, but it helps and is nice. 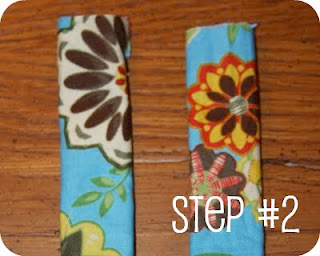 Do this to both ends of each fabric tube. Next, take your trim ribbon and either sew them or glue them to each end, covering up your thread from the straight stitch. If you find using a sewing machine tricky, like I do at times, you can just hand stitch this whole project. And you are done! Ready to wear! Dress up any shirt with these cute tie backs. Of course these can be made in many different fabric prints and colors. And as I mentioned earlier, you don't have to use the felt, but I like to because it gives it a soft, non flimsy feel. Without them the fabric just bunches right up and you don't get to fully enjoy the beautiful fabric you use because you just can't see it. If you don't care for ribbons and bows, or if it is a distraction to your little one, you can make them without ribbon. Just add length to the fabric and felt piece. 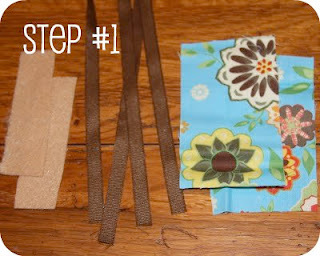 For example: cut your fabric at 5 1/2" x 2" and your felt at 5" x 1". 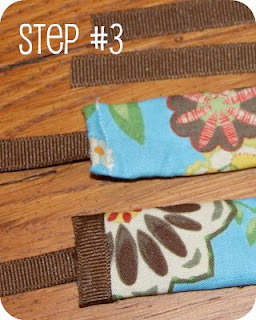 Then add some velcro to the finished fabric so you can just fold them over and secure them into place. This would be good for little ones who like to untie things. They are also good for sports teams. The ribbon doesn't get in the way as they play. Uses: Tie Back T-Shirt Sleeves on hot days or just to dress up a shirt, use as pony tail covers (when using velcro style) and even wear them as cute bracelets. Make them larger for mommy's writs and have a matching set! ***For bracelets, if the velcro is uncomfortable, just use snaps. 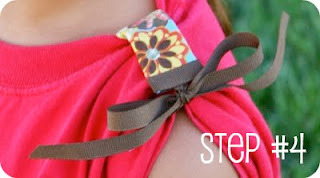 Found this via Craft Gossip, it is a great and easy idea to girlifie a plain t-shirt. Love it. Such a great idea! These would be great for my daughter! I will feature these at somedaycrafts.blogspot.com next week. Grab my "featured" button. Those are so cute and practical! What an idea! So cute and clever! Lovin these! 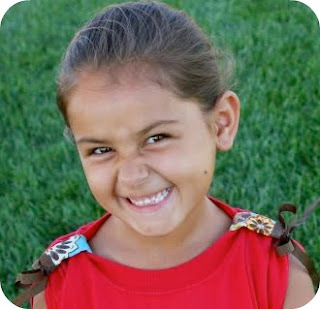 We do this for my daughter with her soccer shirt, it is such a great way to help keep them a little cooler. I made a set of these for my daughter this afternoon. They look so cute on her school t-shirt. A fun way to start the new school year!